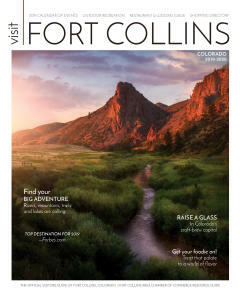 Over the last few weeks, I’ve released guides on how to spend your time in Fort Collins when visiting. Today, I want to tell you (locals and visitors) where to eat. I mentioned a couple of restaurants in my first guide, but today we will dive deeper and discuss multiple options for breakfast, lunch, and dinner. I decided to include a bonus at the end - best happy hour! Let’s start with the most important meal of the day. When you pull up to Lucile’s, at first, you’re not sure if you’re in the right place. You see a small yellow house that looks as if a family may live in it. Then, you walk in and are greeted by the warming scent of their homemade spice tea. Space is limited in this Creole restaurant, but let me tell you, it is worth the wait. I suggest starting with beignets and fresh squeezed orange juice and trying one of their traditional egg dishes. This health-oriented spot offers a dish for almost every dietary restriction. Known for their vegan options, they don’t hold back on the flavor. I’m a big fan of the egg dishes but it’s also worth trying their killer breakfast burrito, which is only $4 and is available for grab-and-go. Located right by Colorado State University, this is a popular spot for students and families alike. Be sure to give their hazelnut coffee a try while you’re there! This is my all-time favorite breakfast spot in town. Offering an assortment of French classics as well as beautifully, dark roasted coffee. You can expect to see croissants, crepes, galettes, stuffed french toast, omelets and more on the menu. One of the best parts? The show ‘Just for Laughs’ is constantly playing, giving you some great entertainment with breakfast. With over 30 sandwiches to choose from, they truly have something for everyone. I haven’t once tried something I didn’t love here. Most options are served with a side of saucy sweet potatoes and a pickle, of course. If you happen to stop by on a Sunday afternoon in the summer check out the Farmer’s Market right outside. Voted the best business lunch for 2018, they mix the ‘classy’ and ‘rustic’ vibes perfectly. Offering juicy burgers, incredible salads and more, there’s no doubt you’ll leave completely satisfied. There are two locations in Fort Collins - Old Town and South. If the weather allows, be sure to sit on the patio at the both locations. I’ve ever had in my life. My personal favorite (and the most popular) sauce is ‘hot’. They do have other options, including (but not limited too) mild, bbq and extra hot. Add a basket of fries and pitcher of beer for the table, and you’re set to watch whatever game is on. Being gluten-free, I have a hard time finding a good option for pizza. Oregano’s blew my expectations out of the water. Not only do they offer great GF options, but their regular pizza and pasta put most to shame (or so my husband tells me). I’m pretty sure this has something to do with their cheese - it drips beautifully off your pizza without being greasy. Pure perfection. This is the go-to place for Vietnamese. Out of every restaurant that I have ever been to I’ve probably frequented this one the most in my life. That being said, I haven’t even tried half of their menu. It’s extensive, and apparently, all delicious. My personal favorites? Traditional Beef Noodle Soup (Phở), Combination Fried Rice, and Hot and Spicy Chicken. It took me until last month to finally find the best happy hour in Fort Collins. And folks, here it is. I’m talking about two-for-one cocktails and glasses of wine. Five dollar appetizers. Two tacos for six dollars. Buy one sushi roll and get the second half off. Oh yeah, and their sushi is also some of the best in town. If you love a good margarita like I do, this is the place for you my friends. They also happen to dish up my favorite Mexican food in town. During happy hour, which runs almost every day from 4pm to 6pm, the drink specials are unbeatable. Get a classic margarita or beer half off. Or, get a whole margarita pitcher (serves 5) for the table at $19 total; normally $33. Or, make a bad decision like I did, and get a pitcher for just two people.